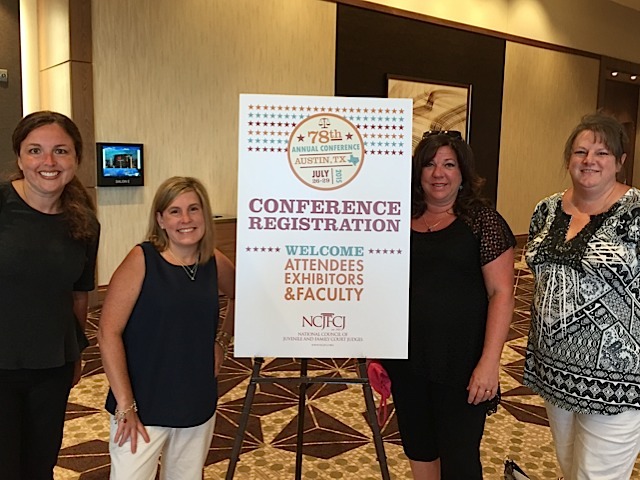 Four members of Family Design Resources' legal team recently attended the National Council of Juvenile and Family Court Judges national conference. They traveled to Austin, Texas, to learn and to promote FDR's Legal Partnership for Permanancy, which we developed to expedite permanency for children by identifying and resolving legal barriers. Under the partnership, FDR employs, trains and places paralegals in child welfare agencies. Dating to 1937, the NCJFCJ describes itself as one of the largest and oldest judicial membership organizations in the nation. It serves an estimated 30,000 professionals in the juvenile and family justice system including judges, referees, commissioners, court masters and administrators, social and mental health workers, police, and probation officers. Photo, from left, FDR's Brooke Milliron, Natalie Witt-Washine, Rachel Meaker and Belinda Muschar. Meaker is legal training division manager; her colleagues are legal services division managers.